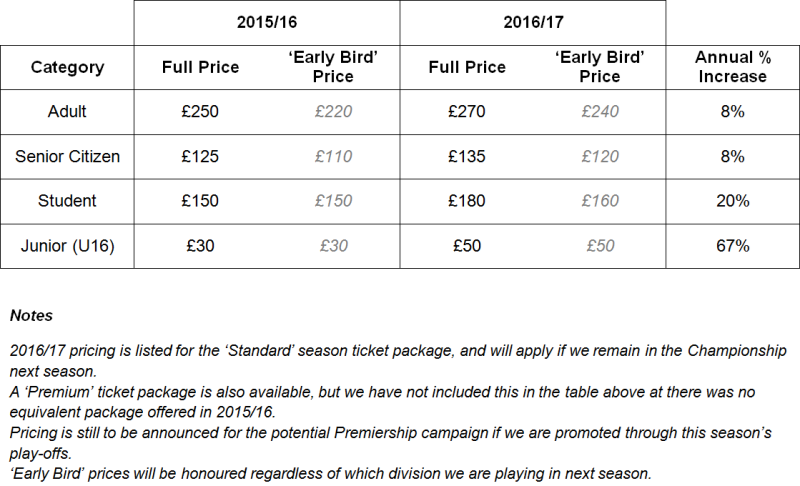 Last week, the club announced season ticket prices for next season’s campaign. Whilst we at the Raith Supporters Trust appreciate that developing a pricing policy is a complex task, one for which there is not a single ‘right answer’, we would like to share our thoughts on the newly-announced prices, and the issues that they raise. We requested advance notice of the new pricing structure ahead of its public announcement, but this request was regrettably declined – we are therefore making public the feedback which we had hoped to be able to offer constructively for consideration by the football club’s board before reaching any decisions about pricing. Firstly, we welcome the ‘early bird discounts’ that have been announced, particularly in light of our possible promotion to the Premiership. In the last few seasons these offers have seen the club benefit from significant numbers of season ticket sales prior to the close season, allowing them to set budgets for the coming season, and to support the manager in his efforts to prepare for the coming season. We anticipate that this offer will be similarly successful this summer. We acknowledge the need to increase revenue to the football club, given the lower than anticipated attendances over recent seasons. This is not a unique situation for Raith Rovers – many clubs across Scotland are faced with the same issue, which is not helped by changes to scheduling to accommodate TV coverage. It has been disappointing to observe that the improvement on the park has not seen significant increases to our attendances. However, we are sceptical as to whether increasing prices will do anything other than further erode our attendances, but accept that it is possible that the increased revenue per supporter will outweigh the impact of declining attendances in the short-term. It is our firmly held view that one of the club’s greatest priorities for the medium- and long-term should be to grow the fanbase, and believe that increasing the price of every category of ticket will make that objective harder to achieve. Turning to the issue of the different price changes for each category of season ticket, we are particularly disappointed that the smallest increases are for adults’ and senior citizens’ tickets, and that the largest increase is for children’s tickets. A 67% increase in the price of any product or service would be an unusual event, but the fact that the price of one category of ticket has increased by so much more than other categories concerns us. We question the wisdom of this particular decision, how it fits within the club’s strategy, and what consultation took place in order to arrive at it. Our understanding is that there were around 250 junior season tickets sold this season, and even if every one of them was renewed for 2016/17 the additional revenue to the club would only be £5000. It is our opinion that this revenue would be better found elsewhere. We note that five Premiership teams currently offer free season tickets for children, and only two clubs have priced their tickets at more than this new £50 price. Of the current Championship teams, there are fewer clubs offering free or low-priced junior season tickets. It is not only on the field of play that we aspire to emulate clubs in the top tier! Increasing the number of children attending regularly was earmarked as a priority several seasons ago, and a lot of time and effort has been expended by a hard-working group of volunteers in order to achieve this. The Roary Club has been running over the past two seasons, with over 460 members, and has been hugely successful. Kids are rewarded for regular attendance at matches, receiving a range of rewards throughout the season, and it is clear from their reactions how much these mean to them. Anecdotally we hear from their parents that ‘the nag factor’ has a knock-on effect on them – on some Saturdays they attend games that they would otherwise have missed, just because their child is determined to get as many Roary stamps on their card as possible! In a survey conducted at the end of last season, 95% of respondents felt that the Roary Club had improved the match day experience for their children, and 75% said it had improved their own match day experience. It also showed 38% identifying cost as a barrier to attending games. This figure rose to 55% amongst non-season ticket holders, and was the biggest factor the club have complete control over – weather and quality of football were stated as the only bigger barriers. From earlier research that we commissioned through our supporter survey in 2009, and again in 2013 to inform the priorities of a volunteer group tasked with increasing attendances and improving the matchday experience, we mapped the life-cycle of a typical Raith Rovers supporter. This research found that supporters typically begin following Raith Rovers as a child, consolidate their allegiance as teenagers, before establishing themselves as lifetime fans in adulthood. Significant ‘drop-off points’, where fans are most likely to stop attending regularly, were found to be in teenage years (as they find other things to do with their time and money), and in adulthood when starting a family (due to financial pressures and football not being considered a suitable thing to do with young children). Our greatest opportunities to grow the fanbase is therefore to get as many young children as possible to begin their football-supporting life at Starks Park, to make it affordable and desirable for them to continue attending as teenagers and young adults, and to encourage parents of young children to think of an afternoon at the football as a family-friendly environment and price that family activity competitively in comparison with other leisure activities. In conclusion, we observe that the largest increases in season ticket prices will directly impact supporters (and potential supporters) at these three critical points in the supporter life-cycle, and we would like to offer our support to the football club in finding innovative ways to overcome the detrimental impact of these changes. Agree with what is being said. Perhaps pricing should have remained at £30 for primary school kids with pricing for s1-s4 at £50.. £100 for s5 &s6…increasing to £150 for students in college or university. Is this not why we have an elected representative on the board, so the Trust and other forum members have the opportunity to influence these decisions before they are made? Just wondering how much consultation there was. For what it’s worth, i think retaining the current adult fanbase is our biggest priority as they are far more likely to still be season tickets holders in 10, 20, 30 years time than our current crop of children are (based on the last 10 years trends) and are also also full paying customers now. (In fact I’d go as far to say that Scottish football as a whole has focused too much on “family football” whilst ignoring their core adult fan base, but that’s another debate entirely. . . ) The early bird direct debit scheme is excellent value for money (based on the current market) and should hopefully make the extra £20 per child affordable. I fear it is the erratic kickoff times that will put people off though as not everybody is able to commit to Friday evening or Sunday lunchtime matches at 4 weeks notice. Bill Thomson liked this on Facebook. Keith Fraser liked this on Facebook. Kirsteen Wright liked this on Facebook. Steve Wallace liked this on Facebook. £50 / 20 games is not an unreasonable £2.50 a game, the kids may or may not buy a programme, I don’t think in the scheme of things this would put off anyone who enjoys going to watch their favourite footie team.Especially since they have been so successful this season.I also imagine the vast bulk of kids tickets will be purchased by their Parent or guardian.Not the end of the world IMHO.